*GIVEAWAY CLOSED* thanks to all who participated and shared the neuroBLISS giveaway. Congrats to Lisa Clark I was unable to hear back from Lisa after trying to reach her via email and looking for her on Facebook 🙁 so I went back to random.org and got a #1 Have contacted Annie C. ! 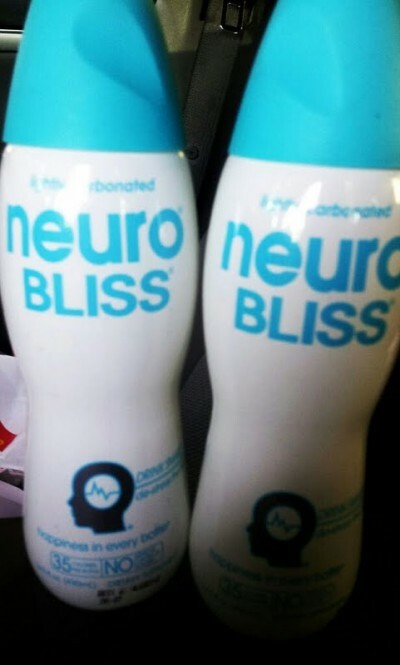 NeuroBliss is a lightly carbonated drink in a 14.5oz bottle. The look of the drink is a little different, looks kind of like coconut water in a white modern-shaped bottle. The main ingredient found in it is carbonated water, other ingredients include: crystalline fructose, gum acacia, ester gum, natural flavors, citric acid, malic acid, sucralose, sodium benzoate, potassium sorbate and soy. As previously stated, the entire bottle is only 35 calories and contains 9g of carbs and 9g of sugar. It has 50% of your recommended daily vitamin D intake, 30% of thiamin, 25% of niacin, 200% of vitamin B6, and 100% of your vitamin B12 intake. NeuroBliss’s secret to happiness is a 335 mg proprietary blend containing: l-theanine, phosphatidylserine, choline alphoscerate, and chamomile. What does neuroBLISS do for you? Simply put, it helps you “de-stress the healthy way”. Neurobliss is specially formulatedÂ with ingredients like L-theanineÂ to help you keep your focus and enhance your mood. The taste alone was enough to put me in a better mood, it was veryÂ similar to drinking a Squirt without all the carbonation and sugarÂ foundÂ in a soda.Â After my first bottle, I did feel more alert at work. It seemed as though I was working more efficiently while in a better mood, and no I have not been paid to say that! Overall I really liked neuroBliss, the citrus smell and taste, the cool bottle shape, and the factÂ I actually felt it have an effect on me are all pros. The only con I can point out is the fact it’s not a low-priced drink (about $2.50 at grocery stores). The bottle warns against children under 12 years of ageÂ and pregnant/nursing womenÂ from drinking it without their physicians consent. It doesn’t further explain why, but I think it has something to do with neuroBliss containing l-theanine which is an amino acid commonly found in green tea. OneÂ person will win a box of neuroBliss drinks. This giveaway isÂ OPEN TO US RESIDENTS ONLY. Mandatory- Leave a comment below letting me know why you need neuroBLISS in your life! Only one comment per person please. Optional Extra entries!- Share giveaway link on Twitter or Facebook, and leave another comment letting me know you did so. Can be shared asÂ many timesÂ as you want, just be sure to comment each time you do for your extra entry to count. Winner will be randomly selectedÂ byÂ using Random.org. Giveaway startsÂ 09/13/2012 and ends 09/20/2012. 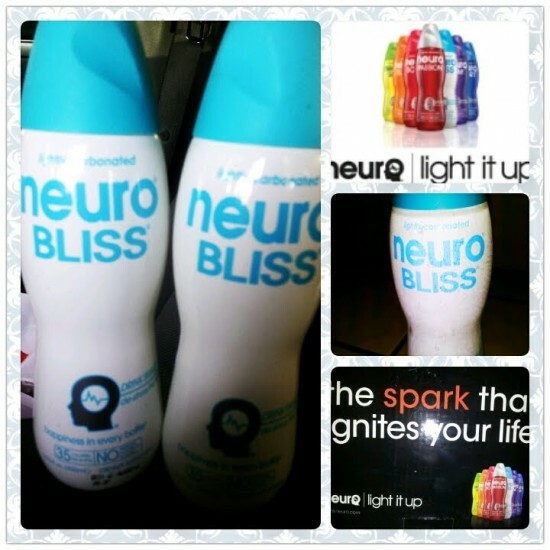 *Disclaimer: neuroBLISS provided me their product so that I may try it and share my thoughts on it. Views and pictures (not including light it up picture used top right in collage) are solely mine. Video and light it up picture provided by neuroBLISS. I heard of this drink before! I would love to win to see if it works. I love these drinks!! I drank NeuroBliss in class and I felt more focused… And I drank NeuroSleep and I slept so good!! I am hooked! But they are so expensive! I really would love to win!! I left another comment on Facebook!